In The Wrath of Achilles, you are Achilles, the greatest hero of ancient Greece. On Troy's battlefields will you honor your code and not fight, or stand beside your men? 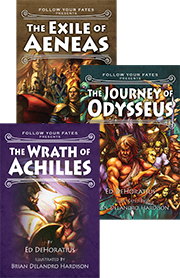 In The Journey of Odysseus, you are Odysseus, the wiliest hero of ancient Greece. Your love of family is as strong as your quest for adventure. What will you do, when given the choice of immortality, or when trapped in a cave by a man-eating monster? In The Exile of Aeneas, you are Aeneas, Troy's preeminent hero. Your integrity is legendary, but can it withstand your city's destruction, grueling exile, and another war?